185 Words - A visit to Raleigh, N.C. is more than a trip to a blossoming Southern metropolis—you'll feel enriched and energized the instant you're warmly welcomed by its smart, savvy locals. Raleigh's bright minds head top-tier technology, education and life science institutions; its artists create a bevy of cultural and culinary touchstones; and its storytellers proudly carry on the collective heritage of a rich, historic capital city. 25 Words - Offering a diverse mix of venues including the Silver LEED Certified Raleigh Convention Center, world-class universities and over 150 hotels, Raleigh, N.C., caters to any size group. 75 Words – The first thing many visitors say about Raleigh, N.C., is, “It’s so green here.” Well, that phrase takes on a whole new meaning with the area’s renewed commitment to sustainability. From the Raleigh Convention Center, one of only two Silver LEED Certified centers in the country, to the world-class universities and companies here seeking environmentally-friendly breakthroughs, Greater Raleigh can help you host a smarter, greener meeting… and even save you a little “green,” too! 75 Words - The Raleigh, N.C., area offers a diverse mix of venues including the Raleigh Convention Center, one of only two Silver LEED Certified centers in the country, to world-class universities, over 150 area hotels and numerous unique venues; making it easy to find the perfect space for your group. When hosting a meeting in Raleigh, the professional staff at the GRCVB is committed to ensuring your meeting is a success with personalized service, value and planning assistance. 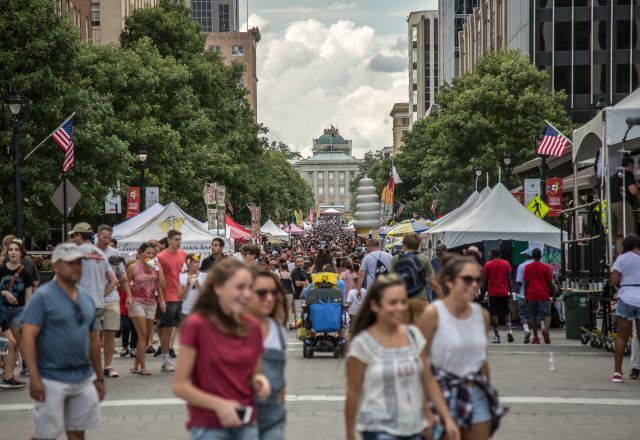 100 Words – Known for historic landmarks and burgeoning cosmopolitan offerings--arts, festivals, sports and shopping--Raleigh, N.C., is the “can’t miss” cultural and entertainment center of the Southeast. Offering a diverse mix of venues including the Raleigh Convention Center, one of only a handful of Silver LEED Certified centers in the country, to world-class universities, more than 150 area hotels and numerous unique meeting venues, the Raleigh area offers the perfect space for your group. When hosting a meeting in Raleigh, the professional staff at the GRCVB is committed to ensuring your meeting is a success with personalized service, value and planning assistance.